Sigma 10-20mm EX DC HSM introduction : Sigma Corporation is pleased to announce the launch of the new Sigma 10-20mm F4-5.6 EX DC HSM lens. 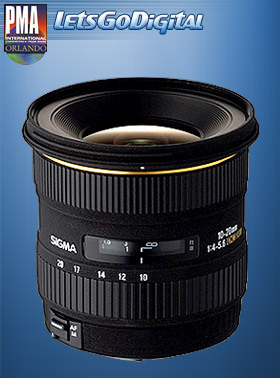 The Sigma 10-20mm F4-5.6 EX DC HSM lens allows enjoyment of super wide-angle photography and it is a very powerful tool for indoor shooting and landscape photography with APS-C size image sensors of digital SLR cameras. Wide angle of view (102.4°at 10mm and 63.8°at 20mm) offers the photographer greater freedom of expression. Three SLD glass elements are employed for effective compensation of color aberration, which is a common problem with super-wide angle lenses. One piece of glass mold and two hybrid aspherical lenses, offer excellent correction for distortion, as well as all types of aberration. This Sigma EX DC HSM lens is equipped with an inner focusing system, and the models which are equipped with HSM system provide quiet, high speed autofocus shooting and also offer full time manual focusing. It has a minimum focusing distance of 24cm ( 9.4” ) at all focal lengths. The non-rotating lens barrel perfectly suits the petal shaped lens hood. A circular polarizing filter can also be used conveniently.